Patients who used the technology—which included a Bluetooth-enabled weight scale, Bluetooth-enabled blood pressure cuff, and mobile tablet with a symptom-tracking app that sent information directly to their physician each weekday—had lower symptom severity than participants who had standard weekly visits with their doctors. "Our study generated evidence on how newer technologies can be integrated into cancer care relatively easily and improve patient outcomes without interfering too much in a person's daily life," said lead study author Susan K. Peterson, Ph.D., professor, Department of Behavioral Science, The University of Texas MD Anderson Cancer Center, Houston. "This study was done during a rather intense period in the patients' care for head and neck cancer. The system helped their physicians to provide valuable support that ultimately resulted in lower symptom severity." 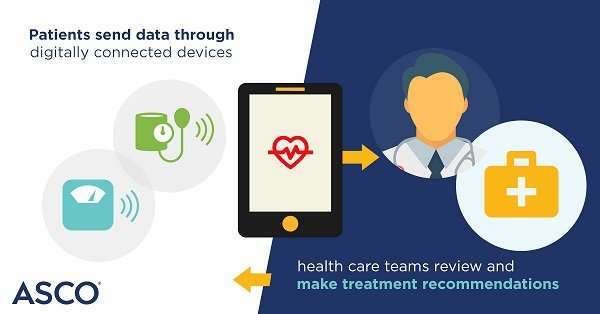 For the CYCORE group, physicians reviewed data from the app and sensor transmissions remotely each weekday and could intervene in a person's care if necessary. Both CYCORE and usual care participants had weekly in-person doctor visits.